Place mushrooms in a food processor and pulse until minced. In a large skillet over medium-high heat, heat oil and butter. Add onions; saute until translucent, about 2 minutes. Add mushrooms, garlic and salt; cook, stirring often, until moisture from mushrooms evaporates, about 7 minutes. Remove from heat; stir in chopped chives. Spoon a generous teaspoon of mushroom filling into the center of a wonton wrapper (keep extra wrappers covered with a damp paper towel). Brush edges of wrapper with egg wash; fold over wrap into a triangle and pinch edges tightly to seal. Place ravioli on a lightly floured baking sheet. Repeat with remaining wonton wrappers and filling. Bring a large pot of salted water to a boil. Meanwhile, make the sauce: In a medium saucepan over medium-low heat, whisk together heavy cream and flour until thickened, about 5 minutes. Remove from heat; stir in cheese, chives and salt and pepper to taste. Set aside. Place ravioli in boiling water and cook 2 minutes; drain. Serve immediately with sauce. Hey, Tablespoon peeps! You’re awesome. We’re out here talking about our love for all things miniature, how peanut butter and chocolate is the best combination in the world, or how we’ve invented a game show called “Taco Time” (oh wait, that’s just me), and you talk back. And we like it. 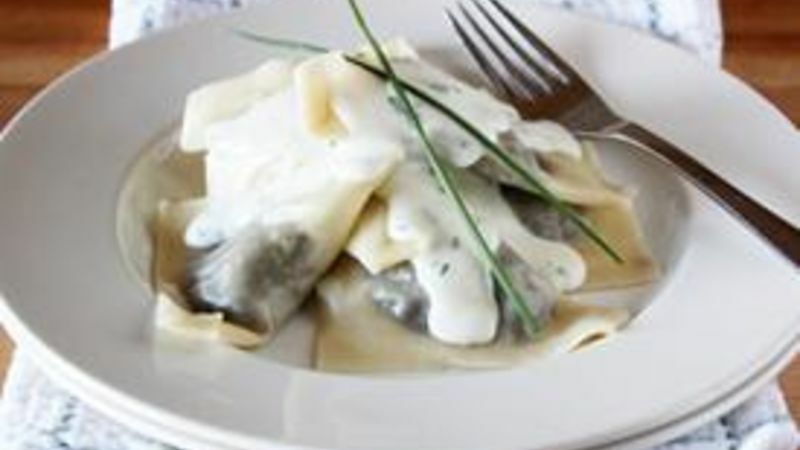 One lovely reader, Amanda, put out a call to us for Mushroom Stuffed Ravioli. Well guess what? You got it, dude…tte. Honestly, I’m super-duper glad Amanda made this request because I. Freaking. Love. Mushroom. Ravioli. And I’m more than happy to have an excuse to make it anytime because I love it so. So saddle up, pardna! We’ve got some ravioli to make. Buy yourself a whole pound of pre-sliced baby portobello mushrooms and place them in a food processor. Now pulse the processor a few times until the mushrooms are finely diced. Then, cook up some oil, some butter, some onions, some garlic and the minced mushrooms in a hot skillet until they’re all friends. Stir in a couple teaspoons of chopped fresh chives for good measure. Spoon a heaping teaspoon of the filling into the center of wonton wrappers. Brush the edges of the wrappers lightly with egg wash, then fold it over into a triangle and pinch the edges to seal. Place each ravioli on a lightly floured baking sheet while you make the rest. This is how we do it! And it’s oh so easy. Next, heat a large pot of boiling water and make the cheesy chive sauce – you heard me. Cheesy chive sauce = Best Thing Ever. Stir up some heavy cream, flour, Parmesan cheese and chives in a saucepan and that’ll do. Cook the ravioli in the boiling water for a couple minutes, then drain and place some on a serving plate. Top with the cheesy chive sauce and try not to cry from its beauty. And now for the finale: The eating. There you go, Amanda! I hope it was everything you dreamed of and more. Oh, and thanks again for being awesome.